If I am contacted to have a clinical evaluation or other testing does that mean I am at increased risk or have abnormal testing? We are interested in evaluating a variety of individuals in this study. We will be asking individuals with no evidence of olfactory loss as well as those with olfactory loss to perform clinical visits and additional testing, including brain imaging. Why test the sense of smell? Research has shown that individuals with Parkinson disease have a loss in their sense of smell and this loss of smell appears to be among one of the first symptoms of the disease. Frequently, loss of smell predates the onset of motor symptoms of Parkinson disease and may serve as an early marker for changes. The sense of smell is relatively easy to test and may provide a simple means to screen large populations. While testing the sense of smell may be a sensitive measure of early stages of Parkinson's, there are many causes for loss of smell making it not a specific test for Parkinson disease. I have noticed that I have a loss of smell, should I participate? You may participate whether or not you notice a change in smell. Although you may perceive a change in your sense of smell this change may reflect normal aging. We will send a brief questionnaire to you to determine if you are eligible. If you have had a broken nose or other event that caused you to lose your sense of smell, you may be disqualified. The questionnaire asks questions that may identify clear causes for a loss of smell. If I have a decreased sense of smell does that mean I have early stages of Parkinson disease? No, some loss of smell occurs normally with aging. This can be due to aging of the nerve cells that control smell. Aging is not the the only cause of smell loss. Other causes include nasal or sinus problems, certain medications (some antibiotics, high blood pressure medications, head injury and cigarette smoking. While smell loss has been identified as an early sign of Parkinson disease, it is a relatively rare cause for smell loss. If I have a relative with Parkinson disease does that mean I am at increased risk for developing PD? There may be a slight increase in risk for individuals with a first degree relative that has Parkinson disease. The risk for developing Parkinson disease is about 2% over the age of 60 in the general population. Individuals with a first-degree relative have about a 4% risk for developing Parkinson disease. Why study first-degree relatives of individuals with PD? In our experience of working with families of our Parkinson patients, relatives have an increased interest and commitment to participation in this research by virtue of having an affected family member. Studies have shown that first-degree family members have a slight increase in their risk to develop Parkinson disease compared to people who do not have a first-degree relative (a sister, for example) with Parkinson disease. First-degree relatives may share many of the same genes and risk factors. By studying relatives, we will have a greater chance of identifying those risk factors. Why will some individuals undergo brain imaging in this study? The brain imaging performed in this study will consist of a nuclear medicine scan that evaluates changes in the chemistry of the brain. One goal of this study is to determine if the brain imaging detects changes in the brain in individuals that may be at risk for Parkinson disease. Will I find out if I am at increased risk for PD through participating in this study? No. We will not be providing test results to the participants as part of this study. The investigators performing clinical evaluations will also be unaware of the test results. I do not live in close proximity to any of the clinical sites participating in this study. Should I participate? Yes. Some individuals will be participating entirely by mail. Individuals that are asked to participate in a clinic visit will be provided a choice of centers that are closest in proximity to complete this visit. Travel expenses to the clinic visit will be covered by the study. If I complete the initial questionnaire to determine if I am eligible am I obligated to participate? No. 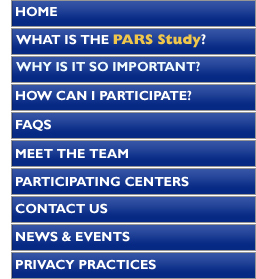 As will all research, your participation is voluntary. You are not obligated in anyway to participate. If you do choose to participate, you my end your involvement at any point during the study.